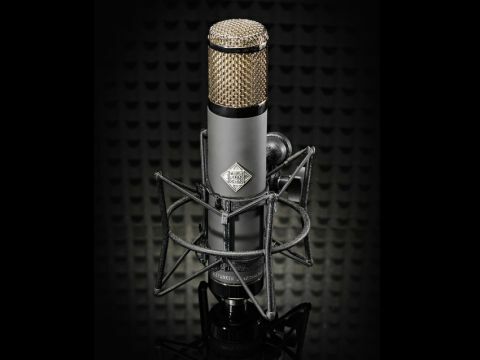 A classic smooth condenser with great all-round performance that lives up to the Telefunken name. Classic smooth condenser frequency response. High standard of engineering. As versatile as they come. For an 'affordable' mic, the price is still steep. The Telefunken R-F-T range has been developed to offer this iconic brand at a more affordable price by using what are coyly called 'off-shore' components. In the case of the AR-51, this means that the diaphragm and power supply are made off-shore, tested in the US and combined with a new-old-stock ECC81 valve-based amplifier and the same transformer as found in their C-12 and ELA M 251E models. As a hybrid design, the AR-51 - looking like a slightly squat C-12 - has been branded a 'utility' mic and, as such, escapes the expectations of a direct vintage facsimile. Even though it's only 20% of the price of a reissue C-12, at £1,500 it's still no impulse purchase. Supplied with shockmount, power supply, IEC cable and 5m mic-PSU connector, the mic itself is weighty, though not too challenging for standard mic stands, and engineered to a very high standard inside and out. The shockmount is simple but, again, of the standard expected from a high-end mic. When Telefunken say it's a utility mic, they really do mean it - we found nothing that the AR-51 sounded bad on, and for many sources it really shines. The tone is classic smooth condenser: never sounding exaggerated or scooped, always allowing the reality of the source to come through unmolested. The proximity effect performance is excellent - vocals, particularly deep male voices, come forward without booming. On guitar amps the same is true, with no low-mid-mush, even right up close. In the aforementioned roles, the smooth response extending across the mid and high frequency ranges manage to balance presence and airiness without over-articulating sibilance or hyping the 10kHz+ range. The nine pickup patterns provide all the variation one needs without becoming nasal around cardioid/super-cardioid. The well-balanced frequency response keeps the foreground/background relationship intact in omni mode and still manages to focus on the forward position on tighter patterns without becoming uneven. The clear low-mid articulation can create the illusion of the AR-51 being a tad bass-light, but there's plenty of low-end extension: it's just not as scooped as on some mics. This even tonal balance makes the AR-51 a rare candidate for corrective EQ, and yet provides a rich source for creative tone shaping. Transient response is excellent, easily capturing percussive sources realistically across a wide dynamic range, from the subtlest snare ghostings to the most intense floor tom wallops. There is no pad control, but the relatively low output gain ( 10dB down from my main valve condenser) means loud sources don't require padding. Despite this, there's enough low noise output to capture quiet sources with a standard 60dB range preamp. The sheer quality of this mic means that £1,500 is a reasonable price to pay considering that it will easily fill that 'lead vocal' spot in a mic collection.